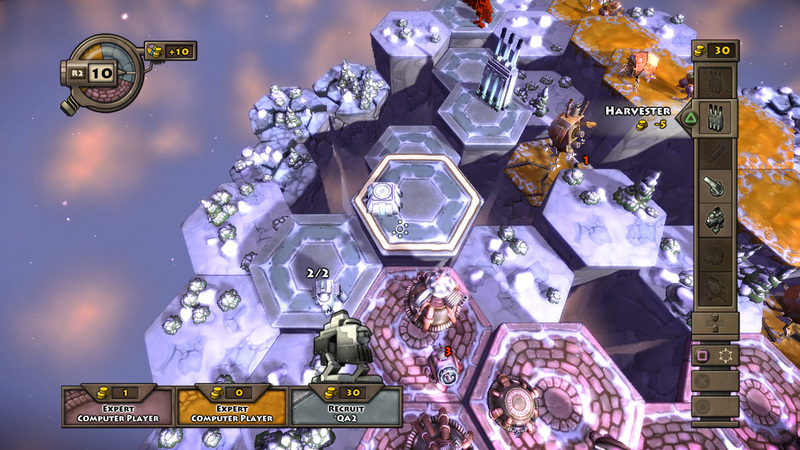 Greed Corp is a turn-based strategy released on Xbox LIVE Arcade, PlayStation Network and PC in 2010. In this board game-like downloadable game, players are literally standing on top of their resources. They need to find the delicate balance between harvesting the land to build an army with and preserving it to have something to stand on. Whoever survives the longest within the ever shrinking environment, no matter the cost, will be victorious. Greed Corp is the first game developed completely independently by W!Games (now Vanguard Games) and set within its Mistbound universe. 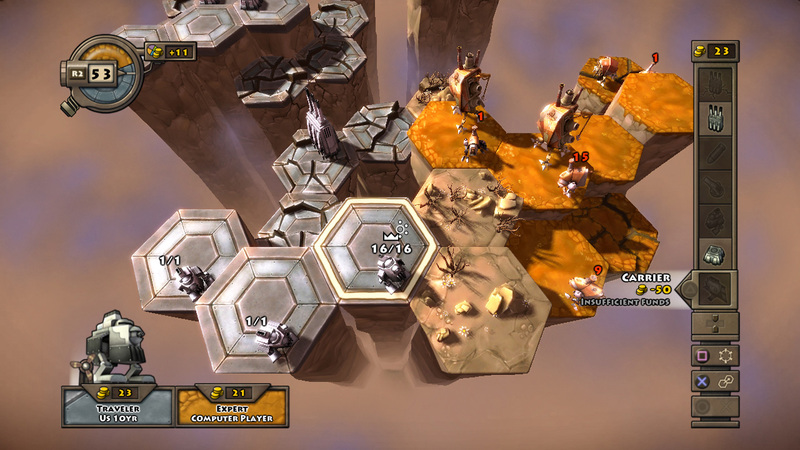 In Greed Corp, players occupy hex-shaped tiles in a playing field and try to remove all their opponents from that map. Walkers are built inside an armory and ussed to claim neutral and enemy tiles. That building can also create carriers, capable of transporting walkers across the entire map. 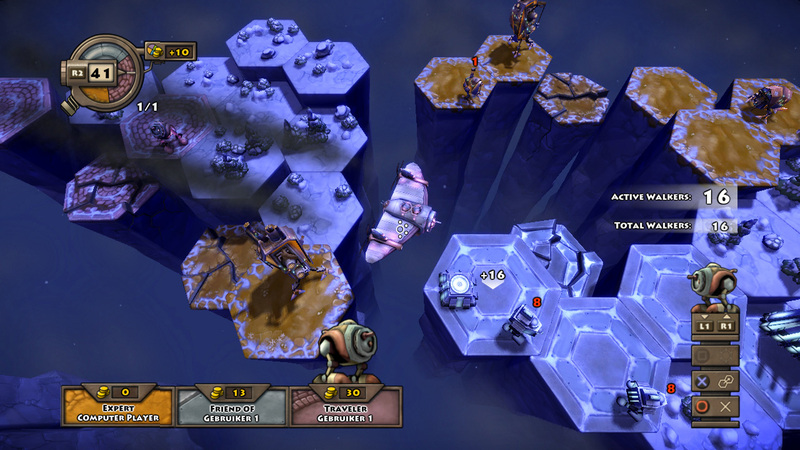 Players can build cannons, which can then be loaded with ammo to fire at tiles and walkers in the distance. But the most prominent building is the harvester, which turns layers of the playing field into credits you can spend on building your army. This eventually destroys the very land you stand on, even more and quicker if you use the harvester’s self-destruct. The unique land collapsing mechanic creates a new layer of strategy and turns every match into a dynamic race for survival in which the pressure keeps increasing. Greed Corp won big in the 2010 Dutch Game Awards. The game both won the Control Industry Award and Best PC/Console Game. That officially makes Greed Corp the best game released in 2010 by a Dutch developer. It was also nominated in the categories Best Original Game Design and Best Audio Design. These awards were handed out during the Control Industry Dinner on November 18 2010, as part of Game in the City in Amersfoort, The Netherlands. Greed Corp was also nominated for the European Innovative Games Awards 2009. 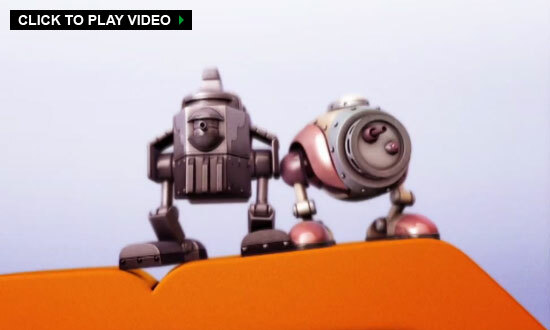 Many more can be found on the Metacritic pages for the Xbox 360, PlayStation 3 and PC version of Greed Corp.